This post is going to be very simple. This picture was captured at a red light. I sent it to my lady in an attempt to bring a smile to her face. 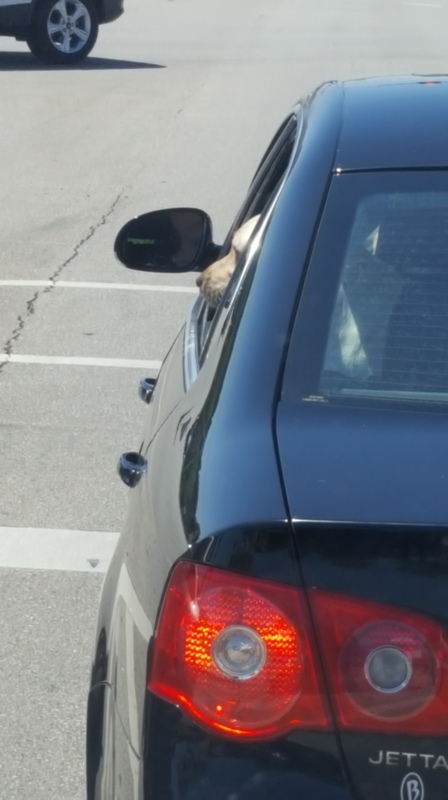 She told me to her it looked like the dog was driving the car. To me that made the picture even funnier. I encourage you to be on the lookout for funny scenes like this. Trust me, they are everywhere. You don’t have to take pictures of them, but you might want to so you can smile at them later. Share them with friends. This will do a few things. One, it will give you an album of pictures that can make you smile when you need it, which is always good. Second, it will get your brain in the habit of seeing the silly side of life. With reminders on every corner of all the trouble in the world, this can be a great skill to have. I bet after doing this for a while, you will see your mood get better and better! Feel free to share what you do to stay focused on the silly side of life and feel free to share any fun silly pictures you have in comments below.